Goals motivate young athletes to work hard, practice and improve. The problem many kids run into, however, is setting unrealistic expectations. When kids set expectations that are too high, they may become frustrated if they fall short of their mark. It's up to parents and coaches to teach kids the critical difference between goals and expectations. Many young athletes expect too much of themselves and lose confidence when they don't perform up to their expectations. For example, some athletes hope to make no mistakes or go four-for-four at bat in a baseball game. When an athlete does make a mistake or falls short of his expectations, he can get upset or discouraged. Instead of dwelling on perfection, help your kids set specific, flexible, realistic goals. Goals give kids purpose, passion and motivation to play hard and improve. To help kids avoid unrealistic expectations, remind them to concentrate on goals that will help them stay grounded and present. These are immediate, day-to-day goals. You don't want them to obsess about the score, the stats or the outcome of the game. While you're helping your kids set goals, don't forget to include mental objectives. For example, encourage your kids to let go of mistakes and focus on the next play. These types of goals help kids stay grounded in the moment. When they stay focused and present, they're more likely to play hard and take the necessary risks to help them grow as athletes. When it comes to goal setting, help your kids take a multi-disciplinary approach. Young athletes can set practice, mental, fitness and nutrition goals. They can also set goals for the near future, and have objectives for the future as they continue to grow and improve. While goal setting is important, remember: don't overdo it. Perfectionists will set goals and see them as a task to master. This can cause burn out. 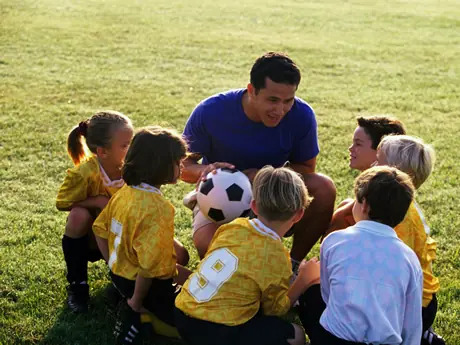 Instead, teach kids to see their goals as general guidelines that will help them grow and improve as athletes, and remind them that one of the most important aspects of youth sports is fun. Find an activity for the whole family.